You know, sometimes you just need to take a break and cut loose a bit. I think this is true in life and true at the gaming table. Now I normally play a pretty serious game at the table and any humor is interjected by the players, but every once in a while I just want a different kind of fun. 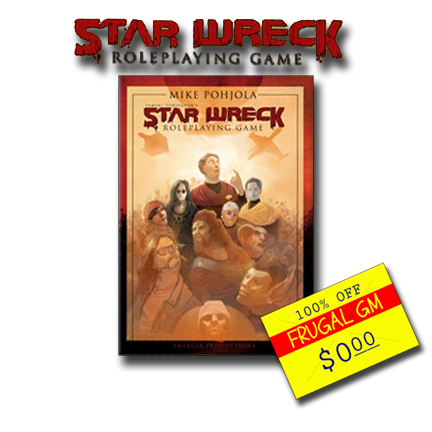 The Star Wreck Roleplaying Game immediately brought to mind the funny card game of Red Shirts. In that game you are basically trying to help other people's away teams succeed so yours is the first to fail...and by fail I mean get killed off. In Star Wrek, you are trying to succeed in spite of yourself. Your PCs don't have ability scores, but instead have disability scores. The scores initially range from 1 to 10, but you roll a 1d6 for each stat and add 2 before modifying for race and class (called class and culture). As you gain experience your characters get to add a disability point, making them worse off, but you get to also add a special talent that can hopefully hide your increasing ineptitude.